Nightsong Trilogy by Sophie Jaff is one of those series that deserves more attention and readership. I know a lot of you here are dark fantasy fans like me, we love myths that delve into the supernatural occult adorned with rich backstories, an interesting cast of characters, and a plot set in unassuming familiar places. Nightsong Trilogy touches on witchcraft, biblical myths, reincarnation, and serial killer themes that make for an unusual yet totally enthralling story. CROWN OF STARS is the second installment in the series and it picks up where Love is Red left off and it maintained that eerie feel. Katherine Emerson finds herself in quite an interesting situation, pregnant and raising a child on her own. Meanwhile, weird things kept happening to her such as people prophesizing about her pregnancy alluding that it's the Messiah, or random strangers coming up to her asking to be healed, people wanting to do her harm or unconsciously bending them to her will, or animals acting bizarrely around her. I was teased for most of the book with these phenomena, motivated to find out wth is up with Katherine's baby and whether or not it's yet another unfortunate event for her. Then there's Margaret. I don't recall reading about her in the first book and obviously, she's connected to Katherine and whatever is happening to her. Margaret's story is set sometime during the dark/middle ages (?) and her story alludes to some powerful witchcraft, angel and demon encounters, heartbreak, and heinous events. 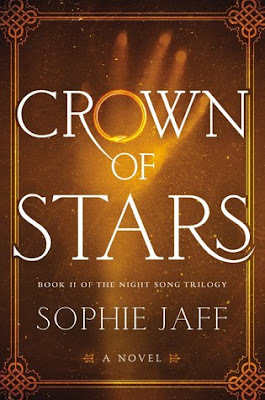 Her story is told alternately with Katherine and that puzzle of how they connect pushed me to keep reading making CROWN OF STARS darn un-put-down-able. CROWN OF STARS is one of the strangest, most chilling novels I've ever read this year. Readers will be faced with that unnerving question of "what would you do if the child you're bearing is something else". SJaff didn't go balls deep into dark fantasy territory but she captured the essence of it and laced it with horror. Also, I love the duality Margaret and Katherine's characters, there's a shared innocence about them that became a transformative catalyst for their respective character development. 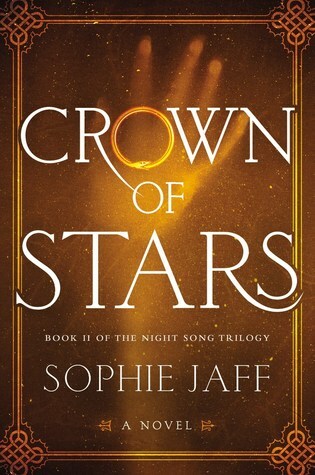 All in all, CROWN OF STARS ended in a high note and I can't wait for the last book because now what?! h'oh boy, yes, that does grab my attention. Thanks, Braine! OMG Braine I'm putting this trilogy at the top of my wish. I love dark fantasy and wow what a situation the heroine finds herself in. Sounds deliciously wicked to me. I think I need to start this series! Added the first book to my TBR! Wow, that does sound like a good one. Oh gosh, when I read your last question, the thought of that old scene from V that aired on tv when I was a kid. The one where the mother has twins and one pops out a lizard and the other a human baby with a tongue. We kids talked about that on the playground for days. Still creeps me out to this day. Ugh. Scary stuff. oh wow this book sounds pretty intense but scary and crazy all at once, but also a book that would make you think too. Woah with the dark fantasy and the middle ages and all the horrifying events happening here, this sounds fascinating! Thanks for sharing. I know a few books that i really enjoyed and wish they were more well known and more readers enjoyed it. It sounds interesting how this book has an eerie feel and there are all these small events and you keep wondering what's really going on. I hope you enjoy book 3 as much as this one. Great review! The middle ages aspect is something that really intrigues me about this one! Great review! This sounds fantastic... I cannot imagine carrying something else, but I want to know more!